Maidenhead Heritage Centre has recently played host to Ibraheem Ali, a Year 12 student on work experience from nearby Desborough College. After some discussion between the Curator and Education Officer, it was decided this would be the perfect opportunity to tackle the stash of curatorial crates that had entered the museum collection a few months ago. 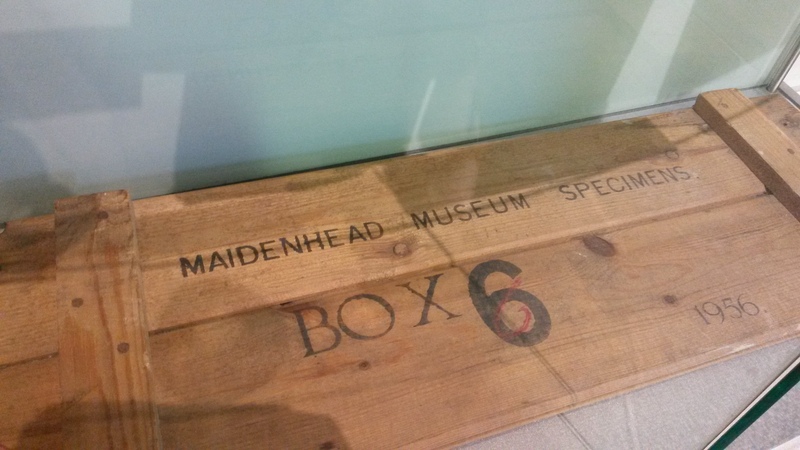 The six wooden crates contain archaeological material from Maidenhead’s past, including flints, bones and large quantity of Roman pottery shards. 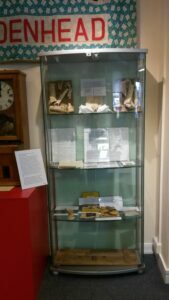 However, these artefacts had remained in the crates untouched since 1956, when they were packed away by the Heritage Centre’s predecessor, the Maidenhead Museum. Following the Museum’s closure a few years later, the crates passed into storage with the Royal Borough collection, before returning to Maidenhead this year. Thanks to Ibraheem’s hard work, photographs of all the artefacts can now be entered into the Heritage Centre’s collection catalogue, meaning we do not need to disturb the crates again until an artefact is chosen for display. 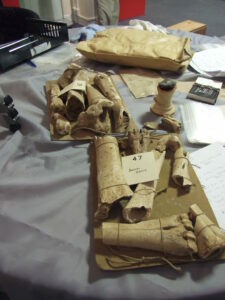 We can also update the paper records about the artefacts – many of which Ibraheem found to be inaccurate! As part of the project Ibraheem also chose his favourite artefacts from the crates, and created a display about them in the Heritage Centre, researching, writing and arranging all the labels himself. We hope that visitors and volunteers alike will enjoy this glimpse into Maidenhead’s archaeological history. A Maidenhead resident dubbed the ‘British Schindler’, Sir Nicholas Winton rescued 669 children from the hands of the Nazis. He passed away at the age of 106 on 1 July 2015. In December 1938, a 29 year old stockbroker from Hampstead called Nicholas Winton was about to set off on a skiing holiday when a friend urged him to change his plans and visit Prague. The Nazis had invaded the Sudetenland two months earlier and the situation in Prague was becoming increasingly dangerous for Jews, many of whom were living in refugee camps. Sir Nicholas was a politically minded young man and agreed to go and witness what was happening in the country. Mass evacuations of children from Austria and Germany were underway, but there was no such provision in Czechoslovakia. After meeting parents who were desperate to get their children to safety, Sir Nicholas began recording a list of their names, before contacting as many embassies as he could to try and arrange asylum. However, most countries had closed their borders and the only positive response he had was from Britain, although there were conditions. The first train left Prague on March 14, one day before German troops marched into Czechoslovakia. While Sir Nicholas headed back to Britain after three weeks – the most leave he could get from his job – two of his fellow volunteers, Trevor Chadwick and Doreen Warriner, stayed behind to keep the operation running in Prague. Back in Britain, Sir Nicholas took on the enormous task of arranging what became known as the ‘Czech Kindertransport’, pleading for funds to cover the £50 guarantee the British government demanded covering the children’s eventual return. He also had to find families willing to take in the children, and secure entry and exit permits. Some children were even provided with false visas, which increased the danger of the operation, and on some occasions Sir Nicholas forged Home Office documents which had failed to arrive before the children’s departure. In total, eight trains carrying children to Britain passed successfully through Germany and France. The children arrived at Liverpool Street Station, where they would be greeted by Sir Nicholas and his mother. While some had relatives in the UK, most went to live with strangers. The ninth train never arrived. It was supposed to leave on September 1, carrying 250 children to safety – the largest group yet. The very same day Germany invaded Poland. Borders were closed, and the children who came to the train station are thought to have been turned away by German soldiers, most being sent to concentration camps. In some cases they were the siblings of children who had travelled on earlier trains. The selfless and courageous actions of Sir Nicholas secured the future of 669 children, who came to be known as “Nicky’s Children”. It is estimated that around 6,000 people across the world are descendants of those he saved. Winton never spoke about the Kindertransport operation, and disliked being dubbed “the British Schindler”, believing that those who helped the mission in Prague took far greater risks than he. In 1947 he began work for the International Refugee Organisation, supervising the disposal of items looted by the Nazis and recovered by the Allies, once again helping victims of the Nazis. In later life he continued to work for charity, including at the Abbeyfield organisation providing care for the elderly. By chance, it was discovered that one of his fellow trustees at the organisation was the son of a child Sir Nicholas had saved. The story remained untold until it was discovered by accident in 1988, when his wife, Grete, found a briefcase containing documents, letters and photos from the mission, along with a list of the children saved. Sir Nicholas celebrated his 105th birthday at the Czech embassy in London with around 100 guests, many of whose parents were saved by him. Barbara’s book is available to purchase at Maidenhead Heritage Centre. Sir Nicholas died on the 1 July 2015, at the grand age of 106. His death came 76 years to the day after 241 of the children he saved left Prague on a train. Sir Nicholas and his wife Grete lived for much of their married life in Maidenhead, where they brought up three children. 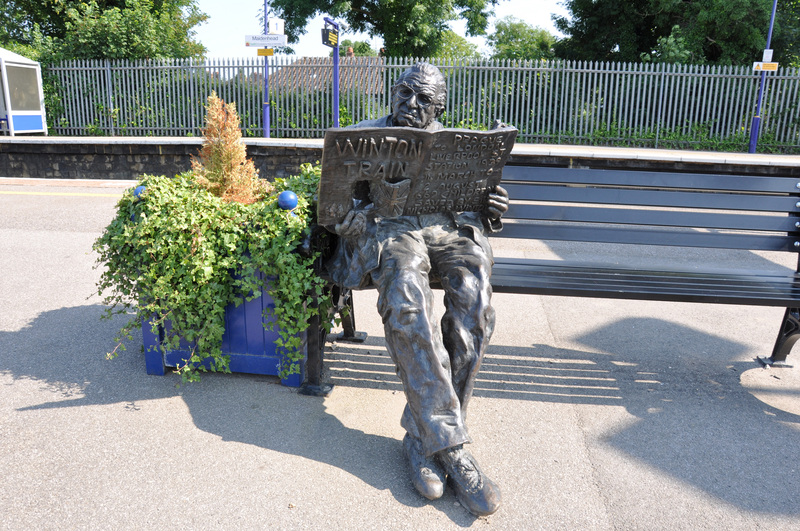 A statue commemorating him sits on a bench at Maidenhead train station, unveiled by MP for Maidenhead Theresa May in September 2010.